The honeybees on this cake aren't exactly biologically correct. Nigella, their inventor, describes them as 'Disneyfied'. I have to admit I picked this cake because they're cute. I also chose this cake because I'm addicted to honey at the moment. I go through eating phases, particularly at breakfast. I am firmly in the runny-honey-and-local-butter-on-thick-white-bread-preferably-brioche phase. I love this recipe. You take sweet butter and cream it with my favourite light brown sugar. You pour in a golden stream of runny honey. You pour in a molten river of dark chocolate. It's beautiful to watch. The final result balances the two flavours of chocolate and honey perfectly. Instead of getting separate chocolate notes and honey notes, they seem to merge. 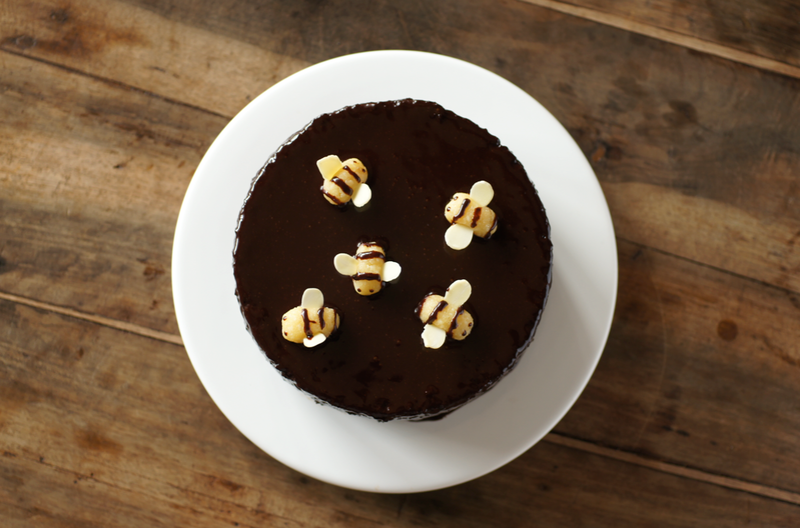 The cake is dense and rich, especially when combined with the glaze (a fascinating water and honey based ganache). I wasn't sure how much I would like this cake but I have to admit it has totally won me over. Both times I have made it a little circular crater has appeared bang in the middle of the cake. The first time I had opened the door a bit early so I presumed it was because of that. Then I made it again today. At the same point as before - 30 minutes in - the cake was beautifully risen and domed when I looked through the door. Yet once again when I looked at 40 minutes (this time having not opened the door), the cake had sunk down an inch and had a crater in the middle. So next time I think I'm going to try a slightly larger tin - probably a 20cm - and see if that helps (I've indicated this in the recipe below, but for reference I used a 6" tin here). I halved the recipe but usually that doesn't cause problems. If you'd like, you can double the recipe back up and use a 23cm tin as in the original. To rescue the situation this time I decided to insert a 'marzipan surprise' and turn the cake over. Nobody minded my little trick. That's the best thing about many baking 'disasters' - outside of our perfectionist world, nobody could care less as long as it's delicious. Preheat the oven to 180C. Grease and line a 20cm/9" tin. Melt the chocolate in a bowl above a saucepan of simmering water then leave to cool. Cream the butter and sugar together until light and fluffy in a stand mixer with the whisk attachment (or with a handheld whisk). Pour in the honey and whisk to combine. Add the egg and a tablespoon of the flour and combine throughly. Scrape in the cooled melted chocolate and whip again to combine. Sift the rest of the flour, the bicarbonate of soda and the cocoa powder into the bowl and whisk again. Slowly add the boiling water to the mix with the speed on low, pausing every few moments to let it combine into a smooth liquid. Pour into the prepared tin and place into the oven. Bake for 45 minutes until springy on top. Cool on a wire rack in its tin until totally cold. Place the water and honey into a small saucepan and bring to a boil. Remove from the heat and add the chocolate. 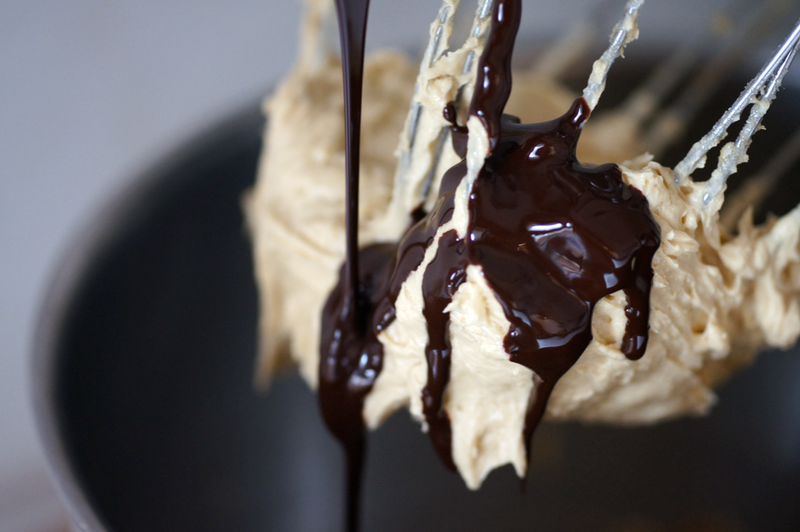 Whisk until the chocolate has melted and the glaze is smooth. Sieve the icing sugar over the top and whisk in. Line your serving plate with four strips of baking parchment to form a square. Turn the cake out of the tin and place in the middle of the strips. Brush any loose crumbs off the cake. Spoon a few tablespoons of the glaze into the middle of the cake and use a small palette knife (or similar) to spread the glaze down the sides off the cake. 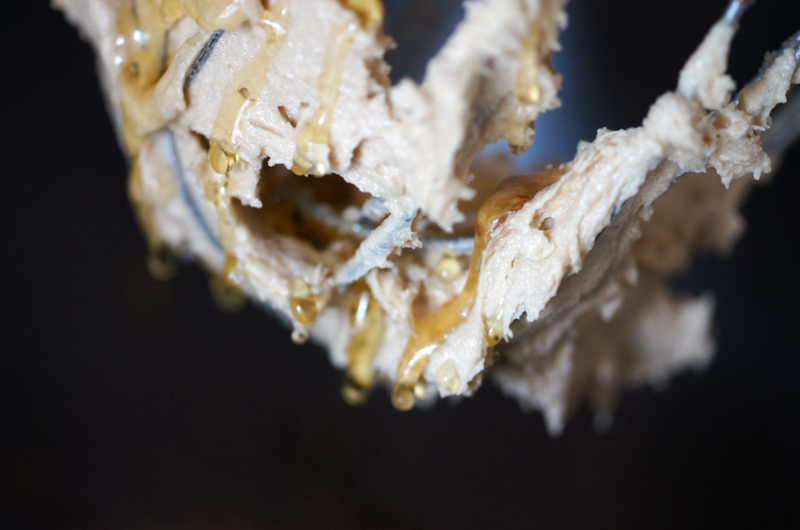 Keep adding the glaze and spreading it until the sides are complete. Add extra to create a smooth top. Leave to set while you make the bees. Shape the marzipan into little oblong bodies, then press two flaked almonds into each one at an angle to create the wings. Use a toothpick and the remaining glaze to draw three stripes and some eyes onto each bee. 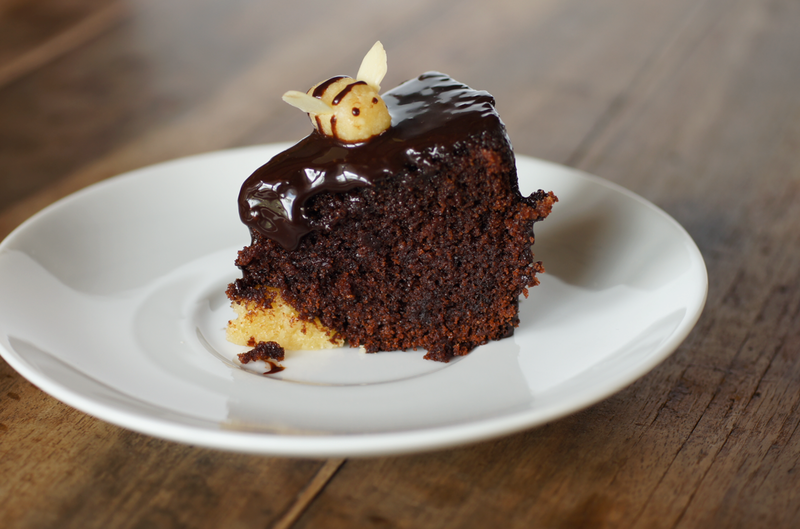 When ready position the bees onto the top of the cake. Very carefully remove the strips of parchment paper and remove any little drips with a damp cloth. This cake, your descriptions and photos have totally won me over as well! I must admit to never really thinking of baking this every time I flick through Nigella's book (that'll be daily...) but I'm definitely thinking again now! I have given this to several of my pupils- they all loved it. It is so moist and deliciously rich. A brilliant addition to Emma's cake repertoire! So cute! I was watching the bees on my lavender this afternoon (before the monsoon rains) & thinking, I must go buy some more local honey... from Tufnell Park in London! Aw...so cute!!!!!!! I happen to have some GORgeous honey jarred with love! thanks! I've seen Nigella make this on tv and she used a food processor so she didn't get much air into it - this could possibly stop it from collapsing? Just a thought. Good rescue for the cake. I've made one of Nigella's chocolate fudge cake from her Bites series. It's dry and unimpressive. Stopped me from making her other cakes ever since. I recently made this (and posted about it) and had the same problem. Mine collapsed when I covered it with tin foil to stop the top from getting too dark (as she suggests). It was perfect until I covered it towards the end, so I thought that was the problem. However I think happens often because she even mentions it in her recipe online and suggests flipping it over before decorating. And hey, nobody minds a marzipan surprise, right? Kate - I'd never really picked it out before either. Then I wanted a chocolate cake a few days ago so I had a flick through and it caught my eye. Harriet - how lovely! I'd heard of London honey on tv somewhere (I remember seeing people tending hives on rooftops), is it good? I'll have to try some in the autumn. Maria - Honey is such a fantastic thing. Enjoy yours! elle marie- they are so cute. And the marzipan is so tasty! Anon - that's interesting - I did think it was pointless to whisk everything up and then fold things in just to pour so much water in it and beat it, effectively loosing that. I might try that, thanks for the tip! pickyin - I do have quite a few Nigella favourites (such as the strawberry meringue cake) but she can be quite hit and miss at times. Nuts about food - That's interesting, I hadn't looked at the online version of the recipe. Flipping it over did work. To be honest the one I made before and didn't bother to ice was almost better for the lack of glaze in my opinion - not as sweet. Ive been wanting to try a honey cake for so long!!!! Your review has really tempted me......and dthose cute bees on top are fabulous! I remember watching Nigella on her show make these with her kids. The bees are such a cute touch. And even if there is a tiny crater in your cake, I can't tell. It truly looks fabulous. Wow! What a stunning cake! The bees are priceless. Sukaina - I've tried a few honey cakes before (I was obsessed with making a fig and honey cake last year but never developed a recipe that really worked) and this wins so far. thelittleloaf - it really is a bit like a pool, I love how you can see the bees' reflections in the top! Bread and honey is such a classic, and for good reason. Lisa - Thank you! The bees are so cute - and great fun to make too. Hi, I just want to say how much I love your blog - the recipes are all mouth watering and your write-ups are a pleasure to read. I love the photos of your creations, can tell you are a very creative person. Best of luck in your future career in baking, I'm sure you'll do amazingly :o) And thanks for sharing your recipes, can't wait to try them (although fear some of them are beyond my capabilities). The Procrastobaker - Oh wow, how exciting to have your own hives! 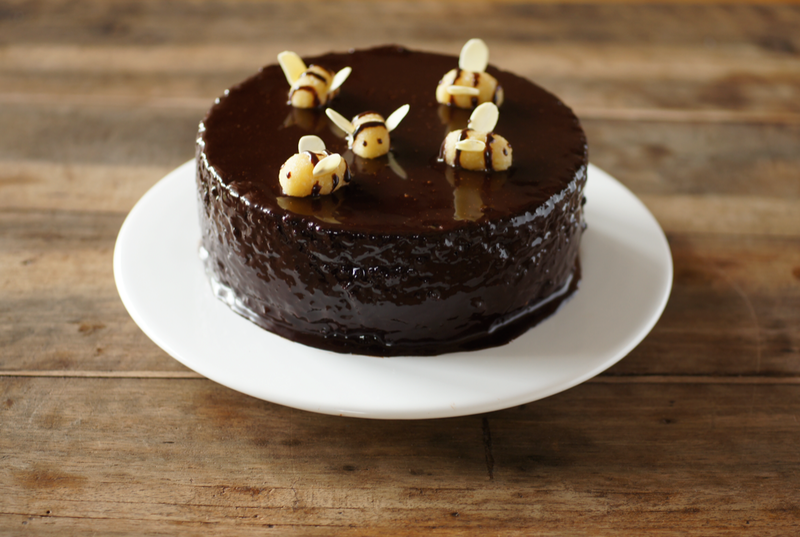 I bet this cake would be even better with your own honey. Claire - thank you for your kind words, it's always so lovely to hear people like this blog. I like the idea of your website, too - roasts are wonderful! Madison - hehe yeah, realistic bees would look a bit bizarre/scary! Better to disney than to make people think real insects have got stuck in it! This looks so lovely! The marzipan surprise was a great save! This is too cute!! And the cake sounds delicious, as well. wow...this looks damn cute n awesome..
first time here..love ur space..
Sara - Glad you like it. I didn't cut back the bicarb any further than halving but it does seem to be a very small amount. As others have had the sinking problem before will the full recipe I don't think it is because I halved it. I might try increasing it a tiny bit next time. Flyer Printing - it is a nice colour combination. Hope they do enjoy it! lwbookeater - thank you! I figured at least marzipan was already being used so it wasn't too odd. Deborah - thank you - it's such a cute idea! Jay - I'll have a look at your site soon, thanks for subscribing! Glad you like the site and this cake. hi there. you posted a picture of an green indian chutney on tastespotting, and i searched all over your site and cannot find it. i would love to know where it is. thanks! Francis-Olive - sorry, there must have been a mistake on tastespotting somehow, I don't have a recipe for green Indian chutney on here. Apologies for that! Here are two recipes from friends I could think of - http://www.journeykitchen.com/2011/07/green-coriander-chutney-and-garlic.html and http://www.indiansimmer.com/2010/08/tadka-tomato-dal-and-green-tomato.html. Hope that helps! Hi from Spain! I've made this cake and I have to say that it's delicious! I used two 10 cm tins and the circular crater apeared (didn't open the door). Just turned over the cake and ready to enjoy! I just made this cake and was sooooo disappointed with the crater that appeared! It was supposed to be a birthday cake and I just didn't feel comfortable with presenting it so my boyfriend is tucking into it instead - it does taste really good! I'll be making Nigella's Old Fashioned Chocolate cake for the birthday cake now as it's crater proof! Thanks for sharing this post, love your photos! Lovely cake - turned out fine. But the glace was very, very runny - too runny really. Did anyone else have that problem? I expect it can be remedied by adding more icing sugar? Got to get this one right as it's my cake for our village cake competition! As it's a glaze rather than an icing it is meant to be very runny - it should be basically liquid so that it smoothly coat the cake when your pour it over. I wouldn't add any more icing sugar, it'll make it too sweet. I would leave it to stand for a bit longer - it's a ganche so it will thicken as it cools. If you're still not happy when it's cooled then you could reduce the water slightly in the recipe. But it needs to be pourable to get the glossy mirror finish. Hope that helps. Two typos! Ganache. Smoothly coats. Many apologies, I've been reading all day and my eyes have gone squiffy.